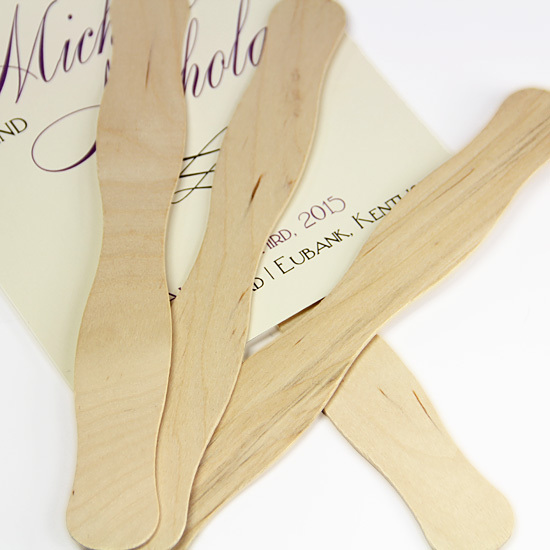 These 1 1/8 wide x 8 long inch wooden sticks feature a decorative wavy design and are perfect for use as wedding program fan handles! Sticks are made of strong, durable, 1/16 inch thick wood in a light tan color. To use, sandwich between two blank cards - round corner blank cards are a popular choice, then adhere with ZipDry paper glue or double sided tape for a professional, wrinkle free appearance. For an even more decorative look, wrap wooden handles with ribbon or tack on a pre-tied self adhesive bow. These sticks are awesome. I was very pleased with the quality. Thank you. I ordered the fan sticks which were a very good quality stick...non of them were warped, they were all perfect and a good size! I also ordered the xacto round corner punch...it also worked great! I was very pleased with my order because it was a great price, and came very quickly! I love LCI the quality and the prices are fantastic! I will continue to use them as long as I continue to share my love with my friends with crafting. Try it... you will not be disappointed. I love the products that I receive from LCI the quality and price have been outstanding. I will continue to use them as long as I keep doing crafting, cards and invitations. The orders are always shipped quickly and the products are wonderful quality!